Certainly, the landmarks are now so familiar to me that I have to remind myself to actually see the forms and shapes in front of me. I could stumble blind across these rocks, the edges of these precipices, without fear of missing my step and plummeting down to sea. Besides, I have always considered that if one is to fall, it is critical to keep one’s eyes firmly open. Not knowing where you are is not about the loss of a future destination or the return to a previous one; rather, spatially it is about a loss of present grounding and temporally about being lost in the present. This form of being lost seems an existential condition rather than a hermeneutic problem. Landscape is never neutral. The very idea of landscape is a manifestation of a specific relationship between human subjects and their agency within space: with our vision, we frame the land and conceive of a harmonious aggregation of land and sky and the details therein. The image of the landscape in painting and photography is often a prospect, whether of fading visions of the past or possibilities for the future, both of which evacuate the present. This imagining intervenes in the environment, yet makes a claim for the natural by effacing its own point of view; W.J.T. Mitchell describes landscape’s mediating power as “not just a representation of a natural scene, but a natural representation of a natural scene, a trace or icon of nature in nature itself, as if nature were imprinting and encoding its essential structures on our perceptual apparatus.” That is, landscape makes an ideological claim that human intention both frames and leaves its traces on the land, and “nature” fills in all the spaces between. This specific conception of landscape flows from the conventions of Renaissance perspective; in a landscape painting or photograph, the elements of the land converge towards the viewer’s position in a pleasing way, and in doing so imply the singularity of that static viewpoint as an ideal abstract position of power. Yet what happens when we are dislodged from that position? What happens when we move within the landscape and the landscape, in turn, moves us? The landscape offered up in a video game – a moving, manipulable landscape – can help answer those questions. Certainly other moving-image artists have worked to undermine and complicate the dominance of this imperial landscape tradition by pointing to that which exists outside it; the Land Art movement and the psychogeographic explorations of the Situationist International are but two examples. Here my aim is to show how a video game, through its specific formal qualities, can participate in that same critical discourse. Dear Esther is a video game originally created in 2007 as a research project at the School of Creative Technologies at the University of Portsmouth; it was remade in 2012 as a stand-alone commercial program with improved graphical and audio quality. Its writer and creator, Dan Pinchbeck, describes the game as using “the basic idea of a ghost story, which enabled a mysterious, empty landscape, with aspects of a psychological drama, where the player-avatar relationship would be pushed to the fore” [emphasis added]. In the game, which can be completed in less than an hour, the player begins on the shore of an island off the coast of Scotland. From a first-person perspective the player can wander through the environment, and although no explicit instructions are given, the blinking red light of a radio tower can be seen in the distance. Like a labyrinth, one path on the island eventually leads to that tower and to the game’s conclusion. The player’s movement through the landscape also triggers snippets of voiced narration: a palimpsest of historical data, fragments of memory, and feverish poetic ruminations. A tenuous, evocative dynamic develops between player action, the written text, and the various island vistas. The experience of Dear Esther oscillates between viewing the landscape and moving through it; mobility evokes an awareness of the contingency of our subject positions. We are thrown into this game and many others in a way that recalls Heidegger’s concept of “thrown-ness”, which he uses in examining that aspect of our existence in which “it is and has to be”; we are thrown into the world and struggle to understand how our existence is defined by the “facticity of its being delivered over.” In a game we continually inhabit the present, trying to make sense of ourselves and our positions in space. This process of making sense through mobility is enacted by player action on the controls, which elicits responses from the game that manifest the haptic qualities of the landscape; the landscape is something that the player reaches towards and can try to grasp. And while many games play with these qualities of mobility and haptics, Dear Esther specifically and critically engages with landscape by foregrounding the tension between the landscape and narrative; rather than using the landscape merely as a setting for a story or gameplay, it “gives space” to the landscape and highlights the reversible embodied nature of game experience. In doing so, it rehearses the controlled framings of linear perspective on the landscape while evoking an understanding that such framings are always constructed, contingent, and multiple. A player always encounters a game in a state of disorientation because he or she must always learn the controls. The player may be familiar with common conventions and thus know that as a first-person game, Dear Esther has one set of controls to move around in space and another to direct the viewpoint like a camera, but each game has nuances within those conventions. Thus players encounter each game from a position of unfamiliarity. More to the point, a player encountering a game for the first time must ascertain where he or she is: the element in space representing his or her subject position in the game. This process resembles emerging from a fugue state, that psychological condition of “sudden, unexpected travel away from home or one's customary place of daily activities, with inability to recall some or all of one's past.” Vivian Sobchack invokes the fugue state in describing what it means to be spatially lost; in losing a clear connection between self and surroundings, one loses “orientational moorings in a vertically elongated and polyphonic space-time that collapses and conflates past and future in and with what becomes a vertiginous and all-consuming present.” This (dis)orientation characterizes every initial encounter with a game. We must always find those moorings in the game’s present. In the first moments of Dear Esther, the image fades in and we see windswept rocky cliffs, lapping waves, and a cloudy sky, with a blinking red light in the distance. While the image seems to obey the conventions of landscape painting, it is simultaneously undermined by the conventions of the game. Rather than an image from a singular fixed ideal position, this point of view is incomplete. In other words, the opening image does not constitute the whole of Dear Esther; rather, something lies on the other side of the hill, and because the game provides us with controls and waits for our input, we are invited to find out for ourselves. When a player takes control, he or she also dispenses with a fixed position. In this scenario, I move the mouse and see just below the initial frame a rowboat crashed upon the rocks and a stone pier underneath me. With another press of a button, I move and hear a footfall. In this moment, one aspect of the game points to the past, while the other aspect points to the future. I have been brought to this point in space and am about to go somewhere else. Between those moments, the present position is contingent; and we inhabit a specific point of view that is partially our own (it is made visible to us on the screen and it responds to our actions) and partially not (we have no connection to it until the image fades in and the controls are activated). When we play a game, we are thrown into this situation, fugue-like: we are given a new position in space and a new identity. Of course, other arts and media can also evoke these concepts of disorientation and thrown-ness, but a game in which we are asked to simultaneously be ourselves and be someone (or something) else engages with this facticity on a direct experiential level. That experience initiates a contingent, shifting relationship with landscape. In Dear Esther, moving disrupts the specific arrangement and convergence of the landscape elements on the viewing position. The ratio of sea to sky to land shifts, and the red light of the radio tower no longer occupies a privileged place on the intersecting lines of the “rule of thirds” associated with aesthetic beauty in the image. That transforms our relationship to the landscape: we need to turn to see the path that leads from the pier up the cliff side, and we need to move down that path in order to approach closer to the red light. In doing so, the relationship between our position as players and that image of the cliff changes; we recognize it as not just a detail in a landscape image but also as a path to traverse through that landscape. Motion multiplies the number of possible perspectives; in the action of situating ourselves, we become aware of the contingency and multi-stability of the landscape. Landscape becomes a process, oscillating between looking-at and moving-through. These shifts in perspective are directly connected to the commands that the player issues through the controls; through that connection the landscape in a game gains haptic qualities. This is not merely in the narrow sense of games that use touchscreens or force feedback, as the term is commonly used in game technology discussions, but also in the sense of “haptic visuality” described by Laura U. Marks, in which the image on the screen becomes something to be grasped. She ascertains that in moving-image media “a haptic work may create an image of such detail, sometimes through miniaturism, that it evades a distanced view, instead pulling the viewer in close. Such images offer such a proliferation of figures that the viewer perceives the texture as much as the objects imaged.” In the context of a game, the haptic extends to how players grasp or reach towards the landscape through embodied action. The player works the controls and unleashes a proliferation of landscape figures, not just through mobility offering different points of view, but through the generation of gameplay forms. That is, the experience of Dear Esther consists not only of the sights and sounds produced in response to player action, but in those very actions themselves. The tensions in the hand are shifting and if we recorded the movements of fingers and thumbs against the plastic buttons we would find a series of crystalline representations of game action, which articulated to their corresponding events on the screen would constitute the game’s “effect-shapes.” In a sense, the important forces that drive the action of the on-screen game fiction are present in the tension between fingers, thumbs and plastic controller. In the experience of a game, a player’s attention and intention are distributed among the screen, the controls, and the connection established between the two. Players often describe the way a game “feels” by evaluating its response to player commands; delayed or unexpected responses make a game “floaty” or “awkward,” while precise and intuitive controls offer the sense of a more direct access to the game’s world. More specifically, this player-control-game relationship affects the experience of space within the world of the game. When a game landscape doubles as vista and terrain, how the player traverses that terrain forms a key part of the experience. Two game environments may appear visually identical, but they will be experienced differently by players if in the first they can only walk at a moderate pace while in the other they can run, jump, and climb as well. Dear Esther offers a pointed example in this vein; as a remake, the 2012 version of the game has substantially improved graphics in comparison to the 2007 original. The environment is rendered with more polygons and more detailed textures than its predecessor, so that, for example, a wall appears to be constructed from individual weathered stones as opposed to looking like a monolithic grey slab, while in the sky clouds interact with sunlight in a relatively realistic manner rather than looking like they were painted onto a flat ceiling. These improvements certainly contribute to the visual aspects of the experience, and make the environment and the images gleaned from it more picturesque. But in terms of player action and control—in terms of walking through the landscape—that aspect of the experience remains substantially unchanged. In a game, the kind of “texture” Marks describes as part of haptic visuality is not necessarily located in how a rock looks, but rather in how it feels to traverse it. When I act upon the controls, I form connections: I press a button and take a step in a certain direction at a certain speed, and if I swing my mouse around, my view turns to reflect that motion. Based on those established relationships, the game can define the terrain at a specific point in space by manipulating those relationships; that is, the player’s commands and Dear Esther’s responses trace the contours of the island and its paths. The sense of being within the landscape of a game does not merely come from crisply rendered foliage or properly reflecting water, but in the stopping sensation experienced by players when bumping into walls, and the difference in difficulty between scaling hilly terrain and walking along a flat path. 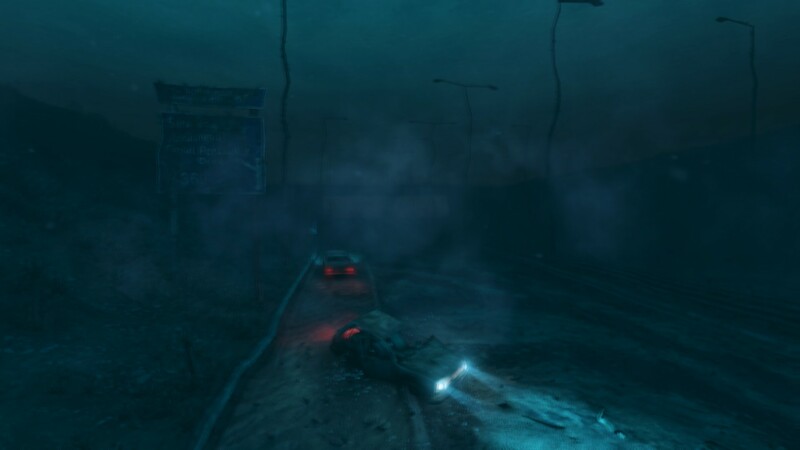 Dear Esther conveys the sense of swimming underwater, for example, by obscuring the player’s view with a translucent filter and distorting the sounds of the environment (changes in the audiovisual representation) while also slowing the player’s rate of movement and allowing for upward motion with the controls (changes in embodied physical tension). Here, the player-game connection is not simple mimesis, but mental and physical investment as intention and action are directed towards the game world. In a very real sense the landscape is located at the player’s fingertips as bodily knowledge is distributed across the player-control-game connection, into the world of the game and back again. The player oscillates between viewing the landscape and moving through it, while Dear Esther’s haptic qualities bind the two states into a coherent embodied experience. That is, Marks distinguishes between optical and haptic visuality by noting that “optical visuality depends on a separation between the viewing subject and the object. Haptic looking tends to move over the surface of its object rather than to plunge into illusionistic depth, not to distinguish form so much as to discern texture. It is more inclined to move than to focus, more inclined to graze than to gaze.” In the moving image the two modes can often be found in dialectical, dynamic tension. Dear Esther activates that tension through the nexus of player intentionality and action, in which the landscape is not just an image but also a physical experience. These concepts of mobility and haptics are present in most games. However, they are often used uncritically: space is just a container for something else, whether as a setting for a story or as a field for gameplay. When those other frameworks take primacy, they overdetermine the subordinated landscape with plot points and rules of play and thus dictate the terms in which that landscape is to be navigated and controlled. Landscape is a given; it is unthought. Yet Dear Esther specifically evades such overdetermination by letting the space “speak” for itself. While it contains gameplay and narrative, they tenuously coexist with the space that gives them form; the product of that relationship resembles what Marks describes in Deleuzian terms as “those images that are so ‘thin’ and unclichéd that the viewer must bring his or her resources of memory and imagination to complete them.” As the player moves through Dear Esther, he or she must fill the gaps of the “thin” landscape by drawing from reservoirs of emotional, intellectual, and physical experience. It may seem strange to say that the game lets the landscape speak for itself, when from the very first moments we encounter the voice of a narrator that immediately provides a story frame for the game experience; he addresses the titular Esther and, by doing so in direct address, communicates directly to the player as well. Through his words we learn of other characters who have visited the island: Jakobson, a shepherd, and Donnelly, a cartographer. We piece together a story and learn that Esther was the narrator’s wife and that she died in a car crash; as we traverse the island, he gives descriptions that indicate we are following the path of a man growing delirious from an infected wound. But the narrator’s words do not fully frame or contain the landscape. Instead, they tenuously float atop it like dewfall that sloughs off as it comes in contact with the mobile player. The narration addresses the spaces around the player but does not fully inform them or bind them into an entirely closed-off system; it does not provide an illusion of completeness. Crucially, the identity of the player’s character as a subject is left indeterminate. The narrator’s descriptions and thoughts follow the player’s movement, but nothing in the space indicates that the player is the narrator. The narrator addresses a “you,” and it addresses Esther; but nothing in the space indicates that the player is Esther either. That subject position in the space of the game world, which is invested with the player’s embodied action, is never closed off by the text of the narrative. A story coalesces around the player’s subject position but never completely converges on it. The tension between story and space becomes strikingly apparent in a key moment of the game, when the narrative begins to solidify just as the landscape itself seems to disintegrate. After exploring the tunnels of a subterranean cave, the player plunges off a cliff into deep water. Following a disorienting transition, the player ends up swimming over an underwater highway and the scene of a car crash – the one described in the narration. And here, in this moment, the narrator is silent. Perhaps this scene is a flashback, or a fever dream, or a non sequitur, but because the game has made the experience of space primary, the scene cannot be fully read or bound into the narrative. The feeling of movement, the feeling of what it is like to traverse the space – the way that the landscape feels on the fingertips – is exactly the same as in the pools of water that lead up to this area. The player passes through, and passes over, this moment in silence. Perhaps they can be experienced within a game. Vivian Sobchack, “Breadcrumbs in the Forest: Three Meditations on Being Lost in Space,” in Carnal Thoughts: Embodiment and Moving Image Culture (Berkeley: University of California Press, 2004), 25. W.J.T. Mitchell, “Imperial Landscape,” in Landscape and Power, ed. W.J.T. Mitchell (Chicago: University of Chicago Press, 2002), 15. The original version of Dear Esther was built as a modification for the first-person shooter game Half-Life 2 (Valve Software, 2004). The remake, which is the version this paper examines, was designed with the contributions of 3D environment designer Robert Briscoe, who had previously worked on the urban parkour game Mirror’s Edge (Digital Illusions CE, 2009). Dan Pinchbeck, “Dear Esther: An Interactive Ghost Story Using the Source Engine,” in Interactive Storytelling: First Joint International Conference on Interactive Digital Storytelling, ICIDS 2008, ed. Ulrike Spierling and Nicolas Szilas (Erfurt, Germany, November 26-29, 2008), 52. Martin Heidegger, Being and Time, trans. Joan Stambaugh (Albany: SUNY Press, 1996), 135. These qualities are immediately evident in attempts by gaming neophytes to learn a typical 3D game; the idea of navigable screen space and the connection between controller and action are often only internalized slowly. But even expert players, when confronted with a new interface or new game mechanic, experience a similar hesitation, if only for a moment. Vivian Sobchack, “Breadcrumbs in the Forest,” 26. While as an “art game” Dear Esther is well-suited to exploring this specific facet of game experience, this process of orientation is common to many mainstream games as well; often the first tutorial sections of a game focus on movement and camera control. The Assassin’s Creed (Ubisoft Montreal, 2007) series encourages players to “synchronize” with viewpoints in high places, where they are presented with sweeping panoramas of the game space. Stuart Richmond, “Remembering Beauty: Reflections on Kant and Cartier-Bresson for Aspiring Photographers,” Journal of Aesthetic Education 38.1 (2004): 84. Laura U. Marks, The Skin of the Film: Intercultural Cinema, Embodiment, and the Senses (Durham: Duke UP, 2000), Kindle Locations 2748-2750. Graeme Kirkpatrick, Aesthetic Theory and the Video Game (New York: Manchester UP, 2011), 103. Laura U. Marks, The Skin of the Film, Kindle Locations 2739-2740. This incompleteness is accentuated by the fact that some of the snippets of narration are randomized, and multiple play-throughs are required to hear all the various possibilities. Nick Dyer-Witheford and Greig de Peuter, Games of Empire: Global Capitalism and Video Games (Minneapolis: University of Minnesota Press, 2009), 28-33. Michel de Certeau, The Practice of Everyday Life, trans. Steven Rendall (Berkeley: University of California Press, 1984), 102. Oscar Moralde is a Cinema and Media Studies PhD student at UCLA. His film and media criticism has been published by Slant Magazine and the Criterion Collection.